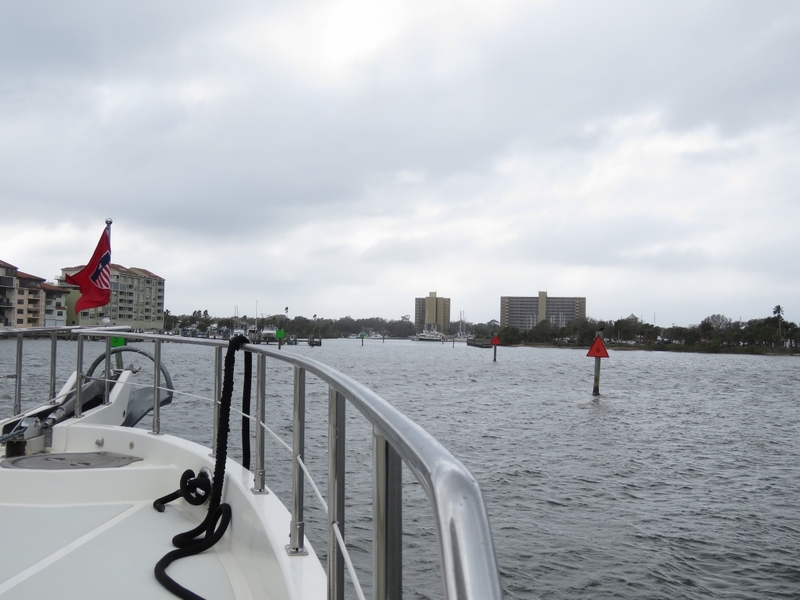 We initially were planning to run offshore from St. Augustine to Daytona Beach, but decided to take the ICW for a couple of reasons. The nearest inlet to Daytona Beach is about 14 miles south of the city at Ponce de Leon Inlet and it looked like it might be a challenging entry. 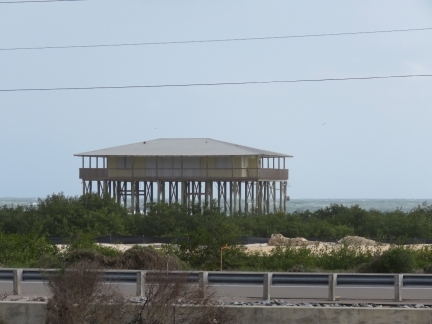 The breakwater there was damaged during Hurricane Mathew and the light on the end swept away. While in Brunswick, we contacted the Ponce de Leon Coast Guard office, who told us that the buoys are all on station and the light was scheduled to be replaced Feb 1st. 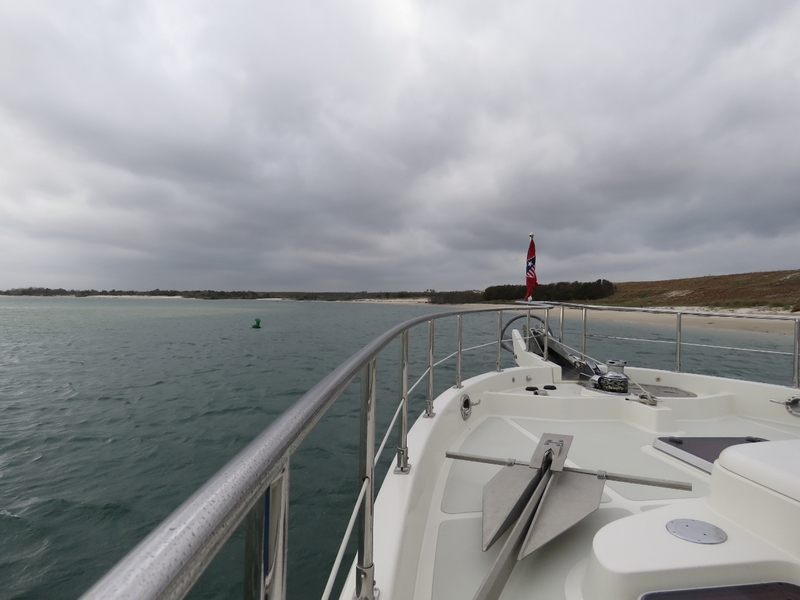 But the least depth through the channel is only 14ft and winds were forecast to reach 25knots there today, so we would have had to leave St. Augustine the morning after we arrived to have calm conditions through the inlet. Partly due to this, but also because we would also have to run an extra 30 miles south of Daytona Beach and back north, we decided to take the ICW instead. From studying the hazards and comments for the ICW run using Active Captain and Waterway Guide , we knew there would be a few difficult places where shoaling restricted the channel, but expected that we could work our way through them. We did, but it turned out to be much more difficult than we expected. In several places we could barely find 7ft of water for our 6ft 7in draft despite travelling near high tide. The video https://youtu.be/8r2Bfn3lcFA shows highlights from the trip, including our arrival into Halifax Harbor Marina at Daytona Beach and a section of the ICW where we had to run so close to a beach shore we feel like we’re on top of it to avoid severe shoaling in the channel. 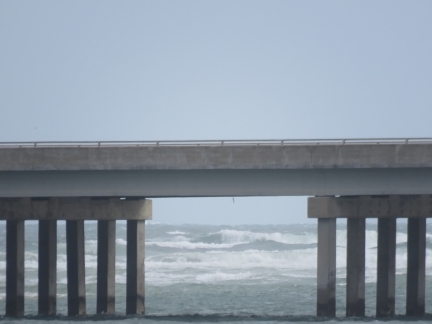 As we near Daytona Beach, the number of bridges increases noticabely as the shore becomes more developed. We also pass the site of a bridge that has been removed with a new bridge is under construction. The replacements for most ICW bridges usually are fixed with a 65ft clearance. Passing under the Bridge of Lions on our way south through the ICW to Daytona Beach. We’re going to pass eleven bridges today, but we’ll only need to have four opened. The Bridge of Lions operates on a fixed half-hourly schedule and the other three open on demand, so we don’t need to time our arrivals at the rest. We’ve been chasing network instability issues since installing the new router a few weeks back and finally isolated the issue to the navigation computer. Changing the NIC in St. Augustine solved the problem but introduced a new one: Windows randomly disabled the network adapter once or twice a day and the only way to resolve it was a reboot. 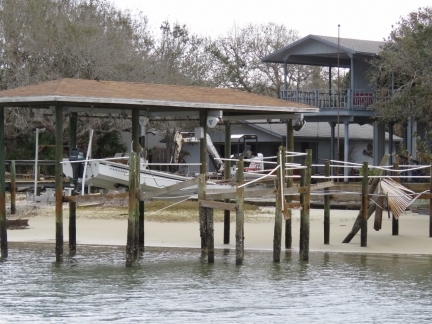 This occurred during our ICW run to Daytona Beach and prevents N2kView from communicating with the IPG100 data source. We didn’t realize it, but it also meant we weren’t tracking our route anymore, so we lost a portion of it until we rebooted the nav computer. 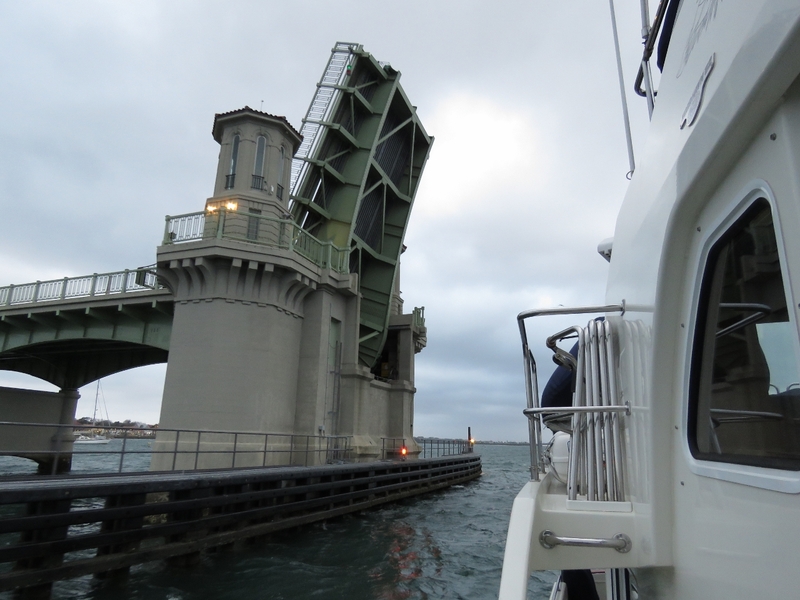 The Crescent Beach (SR 206) Bridge has a 25ft clearance when closed. We’re about 5ft too tall to pass under with our 30ft air draft. 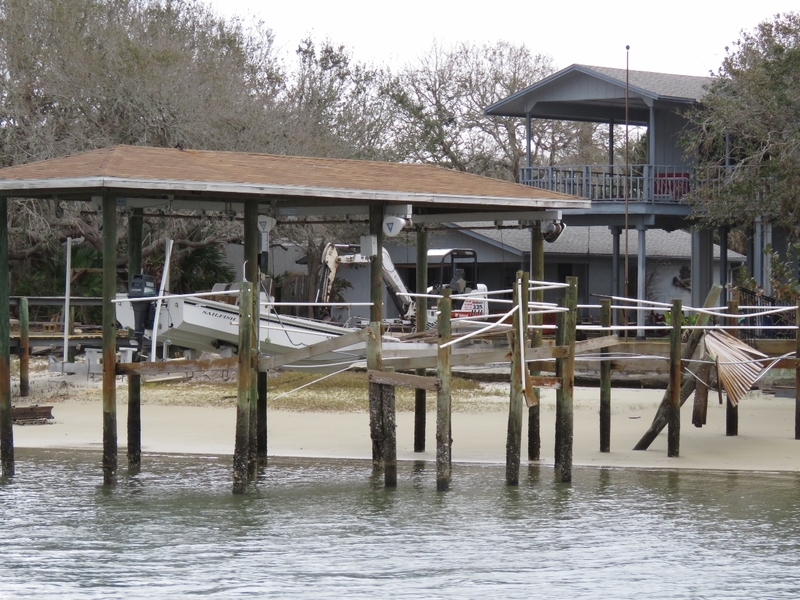 Many of the docks and roofs along this stretch of the waterway looked severely damaged, likely from Hurricane Mathew. The buoyed channel runs within 50ft of shore in this section of the ICW. And we’ll get even closer—shoaling is visible on the left just beyond the green buoy. The charts aren’t even close to accurate here due to shoaling. This is one of three particularly difficult sections that we’ve annotated with a red skull marker, visible to the right of the green buoy. 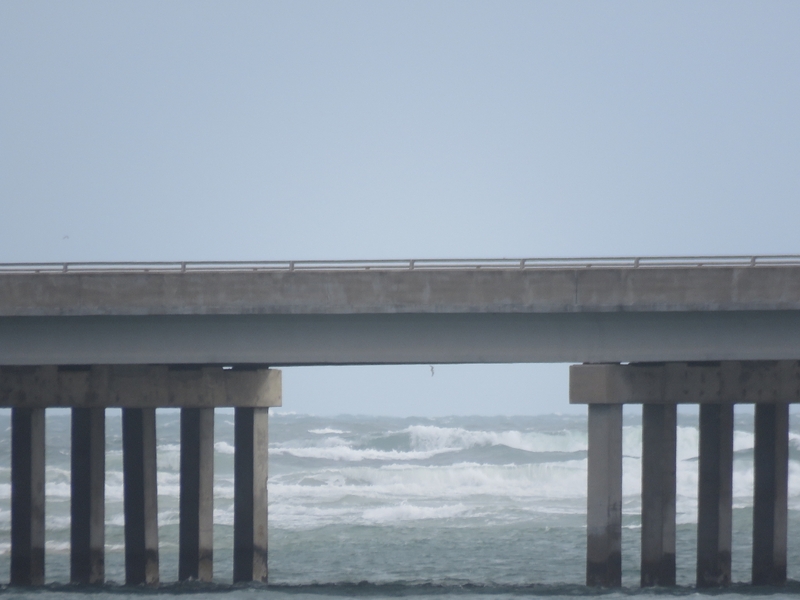 Breakers rolling on the other side of the bridge at Matanzas Inlet. Seeing that we’re especially glad not to be trying to enter Ponce de Leon inlet today. The beach houses in this area were all up on high stilts to avoid storm surge. 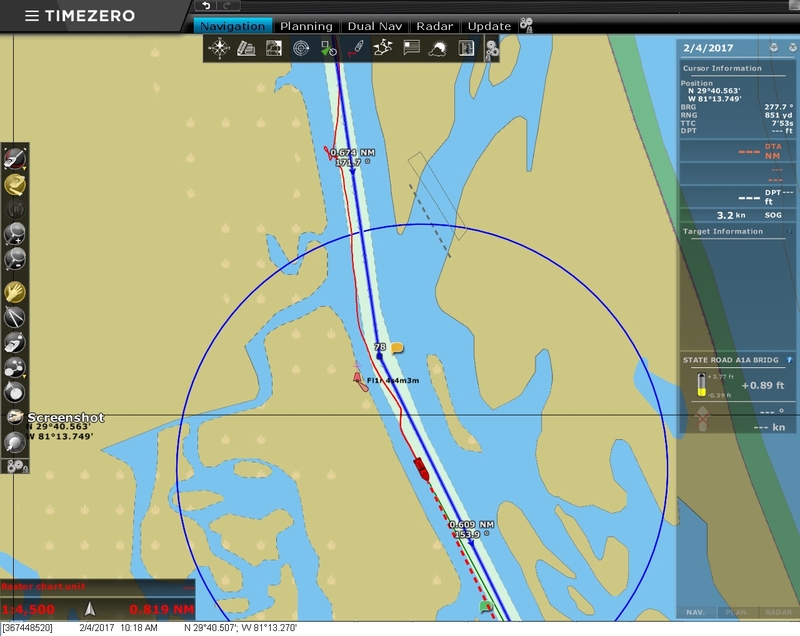 It’s not visible on our web track, but on the chartplotter track you can see where we left the center of the channel to avoid shallows near the top of the screenshot, and backtracked as it got even shallower farther west. We eventually found sufficient depth, although barely 7ft, by running right along the edge of the charted channel. We tried centering up a little farther south, but returned to the edge when we found shallows again. Not us fortunately. 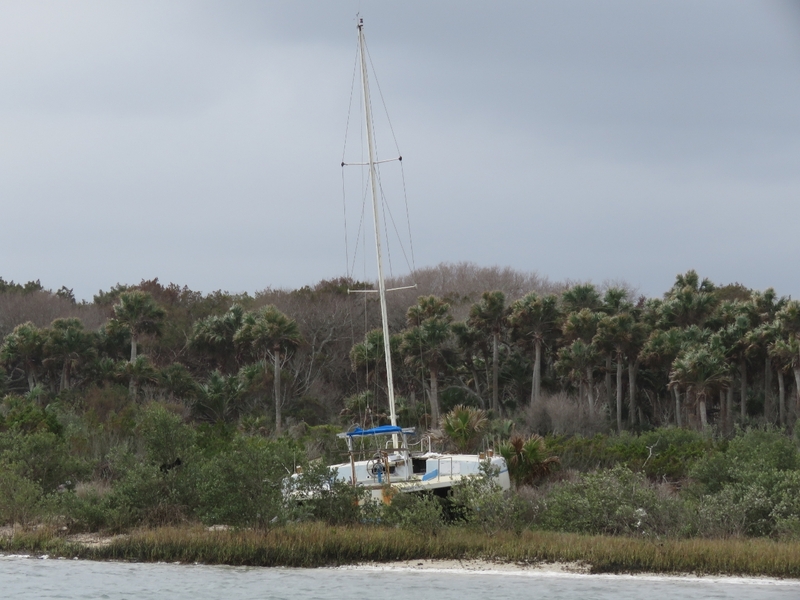 This catamaran is well off the channel, possibly another Hurricane Mathew victim. The Bulow (L.B. 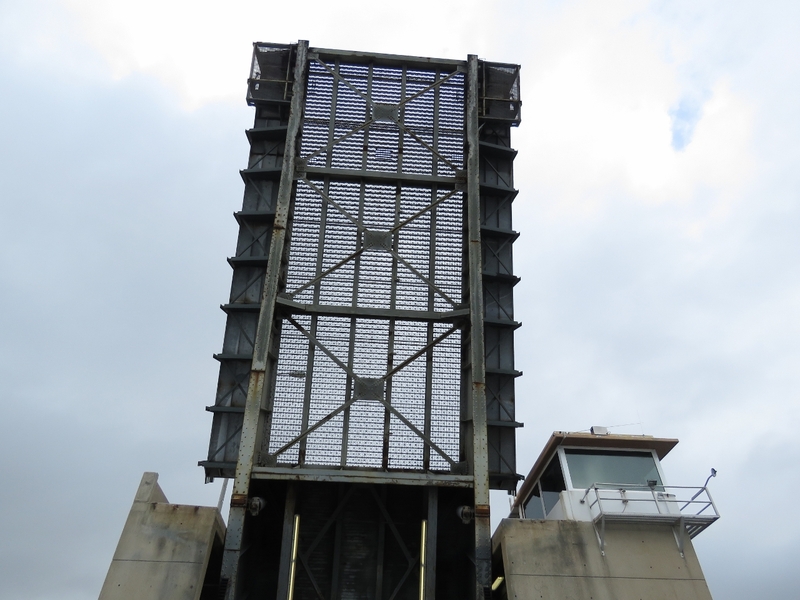 Knox) Bridge has only a 15ft clearance when closed. 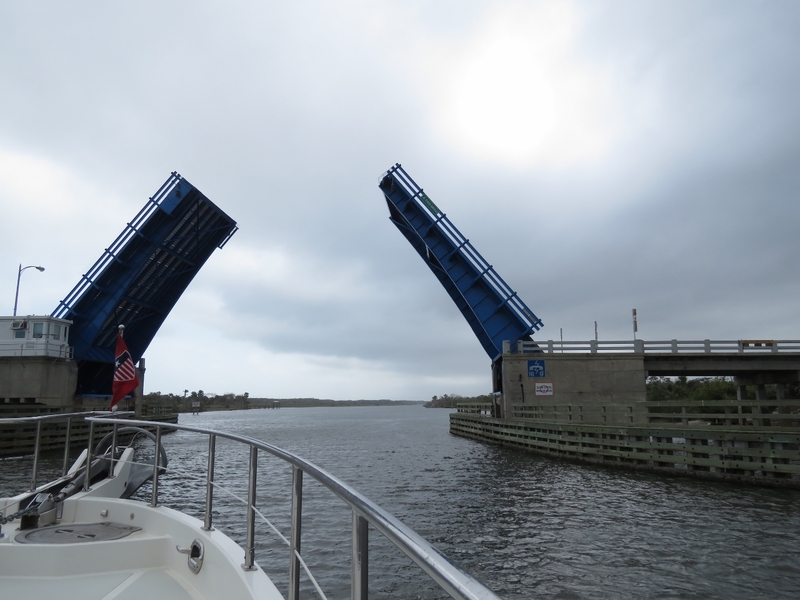 Passing through the 22ft Daytona Beach Main Street Bridge. We’re almost there. The next and final bridge we’ll pass under is International Speedway Blvd.—we’re getting close to Daytona! Coming through the entry channel to Halifax Harbor Marina, our home for the next few weeks. The marina is supposed to have a minimum depth of 8ft, but we were sounding only 7.5ft in the slip with 2-2.25ft of tide. The soundings are slightly off due to thick weed, but we probably have less than 6ft of water at low tide and will be resting in the mud with our 6ft 7in draft. James is using a boat hook to test the depth in another slip to push past the weed and see if it’s any deeper. If anything it was a little shallower, so we’ll stay where we are and be sure to leave on a high tide. One concern we did have was that our HVAC intakes might pull in mud, but the raw water intakes are far enough up the keel on Dirona that wasn’t a problem. taking delivery of a boat in ponce inlet and traveling north to palm coast. 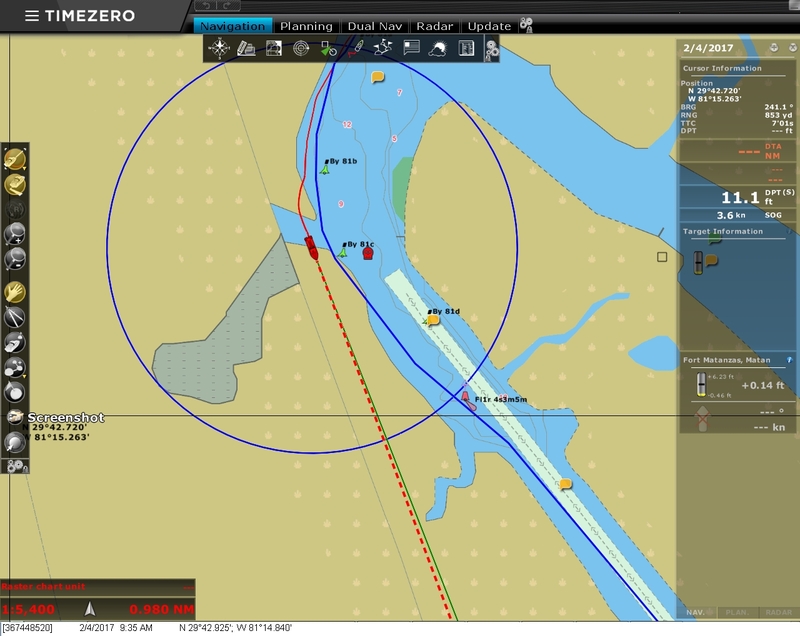 Using the ICW. Any bad areas I need to be aware of. We found Active Captain to have good information on the trouble spots and will be more current than our last trip. 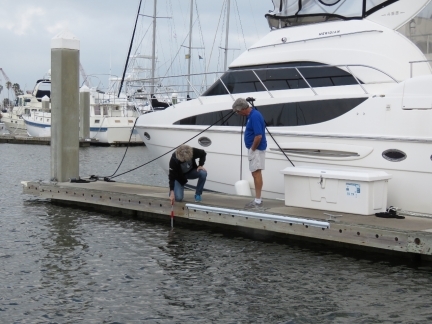 We are planning to put in at Halifax Marina in Daytona for a trip up to St. Augustine to spend the night. Do you know how long that will take? Plan to travel leisurely. 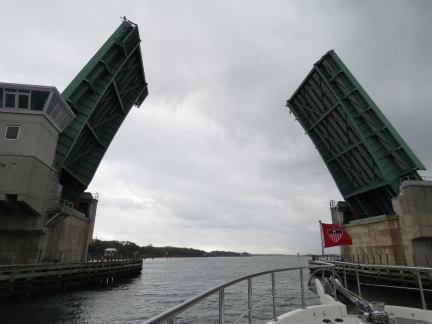 We covered the 46nm from St. Augustine to Halifax Harbor in 7.6 hrs running at an average speed of 6.05kts.